India will host the third meeting of the G20 Framework Working Group (FWG) from March 28 to discuss challenges before the global economy and their possible solutions at Prime Minister Narendra Modi's constituency, Varanasi. The temple-city will be host to more than 100 high-level officials from G20 member and invitee countries, as well as international organisations such as the World Bank, International Monetary Fund (IMF), International Labour Organization (ILO) and Organisation for Economic Co-operation and Development (OECD). Union secretary of economic affairs Shaktikanta Das will inaugurate the meeting as the chief guest. Varanasi's ghats have undergone a swift transformation over the past two and half years, with Modi taking a personal interest in the on-the-ground implementation of the Swachh Bharat Abhiyan in the city. During the 2014 Lok Sabha elections campaign, Modi had said, quoting Mark Twain, "Our Benaras is older than history, older than tradition". He promised to transform the city and make it comparable to the Japanese city of Kyoto. The prime minister had also said that "all roads lead to the temple-city". Ever since then, the constituency has succeeded in wooing central ministry projects of varied size and scale — from the Union Ministry of Agriculture's cow conservation initiative to the building of a multi-modal terminal for cargo ships under the Ministry of Shipping. Further, the city has seen the laying of underground cabling in the temple and ghat areas under the Union Ministry of Power's Integrated Power Development Scheme. The National Highways Authority of India has also picked up a 2003 state government road project for the four-laning of the Sultanpur-Varanasi section of NH-56, with a fresh deadline of May 2017. G20 Leaders at the Pittsburgh Summit held in September 2009 had committed to work together to ensure that global growth is strong, sustainable and balanced. To that end, the Framework for strong, sustainable and balanced growth was launched. In the framework, the G20 members agree on shared policy objectives, assess the implications of national policy frameworks for global growth and agree on policy actions to meet the common objectives. The G20 FWG is co-chaired by Canada and India. The G20 is an informal grouping of key countries founded in 1999 that represents 90 per cent of the world's gross domestic product. In the aftermath of the global economic crisis, it emerged as the key international forum for coordinating a global response after US President George W Bush invited its leaders to Washington DC in November 2008 for the grouping's first summit. Currently, the G20 presidency is with Germany. The G20 members include India, Argentina, Australia, Brazil, Canada, China, France, Germany, Indonesia, Italy, Japan, South Korea, Mexico, Russia, Saudi Arabia, South Africa, Turkey, United Kingdom, United States and the European Union (EU). The Department of Telecommunications on Friday issued a notification, directing all phone service providers to reverify details for all existing subscribers through Aadhaar-based e-KYC (Know Your Customer) process. This follows a Supreme Court order last month in which it had approved the government’s plan to record the identification details of mobile subscribers through an e-KYC mechanism linked to Aadhaar. The move will impact more than 100 crore mobile phone subscribers in the country, 90% of whom are prepaid card users. The process is likely to cost about ₹2,500 crore which will be borne by the service providers, according to industry body COAI. “All licensees shall re-verify all existing mobile subscriber (prepaid and postpaid) through Aadhaar based e-KYC process,” the department said in a notification, adding that the process should be complete by February 6, 2018. Mobile connections used for data services will be verified using the alternate number. The department’s decision comes two days after Union Finance Minister Arun Jaitley moved an amendment to the Finance Bill 2017 to make Aadhaar mandatory for individuals to apply for a PAN (Permanent Account Number) card and for filing income tax returns from July 1 this year. Earlier this week, the Centre made it mandatory for beneficiaries to quote their Aadhaar number to avail themselves of benefits under the Pradhan Mantri Kaushal Vikas Yojana for skill development, and the Self Employment Scheme for Rehabilitation of Manual Scavengers. The Centre had identified 31 schemes in which the Aadhaar could be made mandatory. Notifications have been issued in recent months by departments to make Aadhaar compulsory for getting subsidised grains under the National Food Security Act, jobs under the MGNREGA and pension benefits under the Employees’ Pension Scheme. The department has also asked that companies devise a mechanism to avoid public inconvenience as well as long public queues. “Once a subscriber is reverified and the details in the subscriber base are updated successfully as the eKYC process, the licensee can destroy the old customer application forms of such reverified subscribers unless the licensee is directed to preserve the same by the licensor or law enforcement agencies or judicial forums,” the notification stated. It added that any subscriber acquired through proof of identity or proof of address documents during the period of reverification will also need to be reverified. In January this year, the Telecom Regulatory Authority of India (TRAI) had recommended the use of Aadhaar-based e-KYC for verification of existing mobile subscribers. It had, however, proposed that this process should be optional to the service providers as well as mobile subscribers. HYDERABAD: In a major cause for concern, researchers have found a new strain of highly pathogenic bird flu virus H5N8 in India. It is this strain that had killed birds in Delhi and Gwalior zoos in October last year.The strain has been possibly introduced by wild birds that migrate to different parts of India from other countries during September-March. The strain of H5N8 carries two gene pools from the H5N8 viruses isolated in Russian Federation, Mongolia, Vietnam, China and Eurasia. Bird flu in the country is normally associated with H5N1 strain of the virus. But now a newly re-assorted strain of H5N8, which has thus far been limited to other countries, has entered India. Genome analysis of the bird flu virus that killed birds in the National Zoological Park, Delhi, and Gandhi Zoological Park, Gwalior, in October 2016 has revealed that the new strain was behind the mortality . Following the avian deaths in Delhi and Gwalior zoos, it was thought that the bird flu virus could either be H5N1 or H5N8. But now researchers reveal it is a new version of H5N8 carrying the genetic material of H5N8 viruses in other countri es. Many zoos in the country including Hyderabad, Tirupati and Visakhapatnam face the threat as the migratory season will last for a few weeks more. The research finding by scientists from the National Institute of High Security Animal Diseases, Bhopal, appeared in the latest (April 2017) issue of the Emerging Infectious Diseases, published by the Centers for Disease Control and Prevention (CDC) of the USA. The viruses from dead birds in Delhi and Gwalior are different from the existing strains. "They are 7:1 reassortants of H5N8 viruses isolated in May 2016 from wild birds in the Russian Federation and China. This suggests the virus has spread to India during southward winter migration of birds," the research study revealed. As part of the study , 83 samples from the dead birds waterfowl and painted stork - were collected and 20 avian influenza viruses were isolated from them. Referring to the study , Prof Niyaz Ahmed of the department of biotechnology & bio-informatics, University of Hyderabad, points out that the strain has not caused harm to human beings thus far. " At least 24 European countries have reported H5N8 outbreaks since June 2016. Countries in Asia, the Middle East, and Africa have also reported the virus. However, none of the countries has thus far reported any human infections with this virus," he said. He, however, adds that theoretically it is possible that some random mutations could render the virus more adaptogenic to mammalian system. Prof Niyaz Ahmad suggests that efforts to block contact of migratory birds with farmed poultry should always be in place in all seasons and situations to stop the virus. It’s a rebirth for the Kuttamperoor river, a tributary of Pampa and Achenkovil rivers. The river is getting a new lease of life thanks to a drive to remove accumulated waste. A 5 km stretch flowing along the Budhanoor panchayat in Alappuzha district has been cleaned up. Thick layers of water weeds and waste dumped into the waterway for over a decade were removed. A river cleaning scheme covering 12-km long, had been drawn up many years ago, but could not get proper funding. “The project was implemented under the Mahatma Gandhi National Rural Employment Guarantee Scheme. About 200 workers were engaged for the work during a two-month period, generating 30,000 man days. A sum of Rs.72 lakh was spent on the project,” P. Viswambhara Panicker, Budhanoor panchayat president said. “Waste materials such as plastic bottles, containers and food refuse dumped by unscrupulous catering units had ruined the flora and fauna. Once the natural flow was obstructed, the polluted water infiltrated into drinking water resources, including wells along the river. Wells dried up in many adjoining areas,” Mr. Panicker said. Redeeming the entire river could be achieved through joint efforts with neighbouring panchayats such as Mannar and Pandanad, said N.K. Sukumaran Nair, environmentalist and general secretary of Pampa Parirakshana Samiti. “The river, which was 100-130 ft wide in its heyday, has shrunk to 10-15 ft at many locations due to encroachment. Stern measures are required to evict the encroachers,” he says. The river used to play a key role in natural flood control. Whenever the Pampa and Achencoil were in spate, the water flowed into the Kuttamperoor river, saving a large area from flooding. Idols of several temples were bathed in the river during ‘Aarattu’ festivals. There is now a panoramic view of the river, and the operation has opened a new phase of freshwater fish growth. “Fishermen have thanked us because there is new hope to return to their livelihood,” Mr. Nair said. Indian para athletes bagged eight medals, including three golds, in the 9th Fazza International IPC Athletics Grand Prix in Dubai. With 3 gold, 1 silver and 4 bronze medals till the second day of competitions, India are currently at the seventh spot out of 48 participating countries. Sundar Singh Gurjar was the star among the Indians as he won a gold each in men's Javelin Throw F-46 and Discus Throw F-46 competitions. The 21-year-old Gurjar, who lost his left hand in an accident two years ago, threw a best of 60.33m in Javelin Throw F-46, a whopping 11m more than the second best. He threw 44.56m in Discus Throw F-46, over five meters clear of the rest of the field. Gurjar could not take part in his event at Rio Paralympic Games last year due to late reporting at the event arena but on Wednesday he proved his mettle at his very first opportunity. The third Indian gold was bagged by Narender Ranbir in men's Javelin Throw F-44 with an effort of 47.75m, a release from Paralympic Committee of India said. The other Indian medal winners were Anandan Gunasekaran (silver) in 400m Men T-42/44/46, Ramkaran Singh (bronze) in 800m Men T-13/20, Surjit Singh (bronze) in Shotput Men F-40/41/42, Rohit (bronze) in 400m Men T-11/12/13 and Pramod K Yadav (bronze) in 400m Men T-42/44/46. Six scientists from institutions across the United States argued that Pluto deserves to be a full planet, along with some 110 other bodies in the solar system, including Earth's moon. Pluto and its newfound kin in the solar system's distant Kuiper Belt region were reclassified as dwarf planets, along with Ceres, the biggest object in the asteroid belt between Mars and Jupiter. The decision left the solar system with eight planets. But this definition sidelines the research interests of most planetary scientists, said the paper's lead author, Kirby Runyon, a doctoral candidate at Johns Hopkins University. Runyon said he and other planetary scientists are more interested in a planet's physical characteristics, such as its shape and whether it has mountains, oceans and an atmosphere. "If you're interested in the actual intrinsic properties of a world, then the IAU definition is worthless," he said by phone. "There’s a teachable moment here for the public in terms of scientific literacy and in terms of how scientists do science," Runyon added. "And that is not by saying, 'Let's agree on one thing.' That's not science at all." Runyon's group advocates for a sub-classification system, similar to biology's hierarchal method. This approach would categorize Earth's moon as a type of planet. "It really takes blinders to not look at the solar system and see the profound differences between the eight planets in their stately circular orbits and then the millions and millions of tiny bodies flitting in and out between the planets and being tossed around by them,” he wrote in an email. A new model developed by scientists at Purdue University in the U.S. suggests that debris that was pushed into space from an asteroid slamming into Mars around 4.3 billion years ago alternates between becoming a planetary ring and clumping together to form a moon. According to one theory, Mars’ large North Polar Basin or Borealis Basin — which covers about 40% of the planet in its northern hemisphere — was created by that impact, sending debris into space. As the ring formed, and the debris slowly moved away from the planet and spread out, it began to clump and eventually formed a moon. Depending on where the Roche limit is, Mr. Hesselbrock and David Minton believe this cycle may have repeated between three and seven times over billions of years. Each time a moon broke apart and reformed from the ring, its successor moon would be five times smaller than the last. 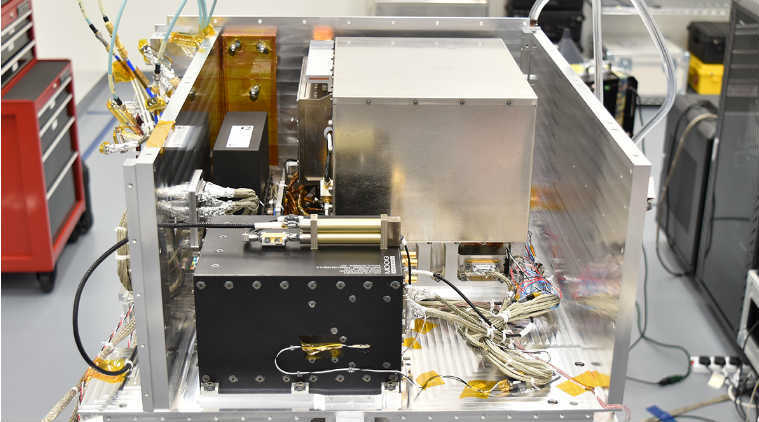 NASA will send its next-generation atomic clock into space later this year, a key advance for safely navigating future human exploration of the solar system. Timekeeping plays a critical role in spacecraft navigation and will be especially important for future deep space missions. The clock will be smaller, lighter with magnitudes more precise than any atomic clock flown in space before, NASA said. The Deep Space Atomic Clock was developed by NASA’s Jet Propulsion Laboratory in California. Last month, JPL engineers monitored integration of the clock on to the Surrey Orbital Test Bed spacecraft, which will take it into the orbit later this year. Most spacecraft are tracked using “two-way” methods: the ground-based antenna ‘pings’ the spacecraft and waits for the signal to return. By measuring how long the signal takes to travel, the distance to the spacecraft can be calculated. A navigation team then processes this information to determine the spacecraft’s flight path and determine if any course corrections are required. The clock enables “one-way” tracking, where the spacecraft does not need to send the signal back to Earth. The tracking measurements could be taken onboard and processed with a spacecraft-based navigation system to determine the path and whether any manoeuvres are needed to stay on course, NASA said. This will be a key advance for safely navigating future human exploration of the solar system by providing astronauts with their position and velocity when they need it. It will lighten the load on the antennas in NASA’s Deep Space Network, allowing more spacecraft to be tracked with a single antenna. The Deep Space Atomic Clock would also improve the precision and quantity of the radio data used by scientists for determining a planet’s gravity field and probing its atmosphere.